Learn more about each member of our Board by clicking their name above, or on our 2019 Board page. 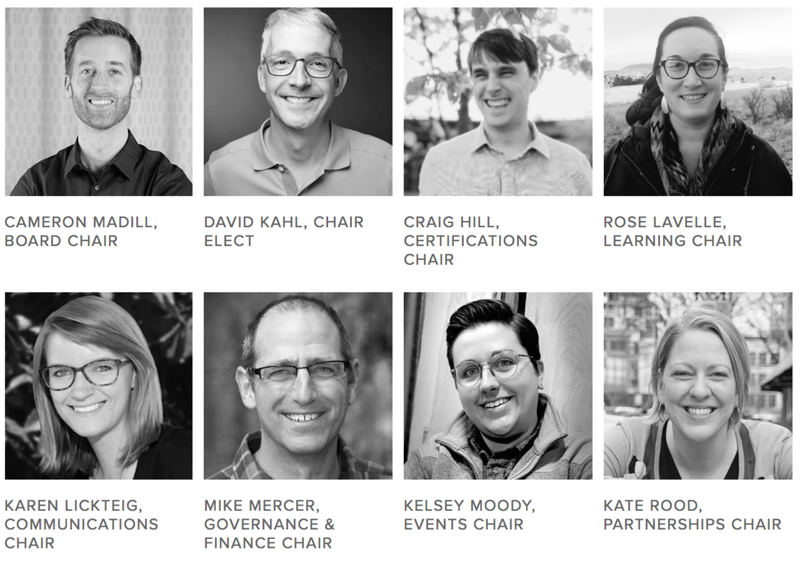 Six of our eight 2019 Board members are returning, and two of them have new positions: Mike Mercer is now Governance & Finance Chair (previously Partnerships Chair); and Kate Rood is now Partnerships Chair (previously Events Chair). These role shifts represent the evolution of our organization. Emily Goetz concluded her term as Learning Chair at the end of 2018. Late last year we opened up applications for two positions to be filled: Learning Chair and Events Chair. We are lucky to have found two stellar candidates to fill these position. In 2019, Kelsey Moody of The Joinery will join us as Events Chair, and Rose Lavelle of Scout Books will fill the role of Learning Chair. Here are a few thoughts from their applications. It is clear that there is a shift to focus on Equity, Diversity and Inclusion throughout the B Corp Community. I am very inspired by this and would like to make this a key effort in my contributions. I also want our community to not just recognize, but celebrate intersectionality. I want our community to raise up and give voices to those who aren't heard enough. In a place like Portland that celebrates uniqueness, yet often hides a challenging past and our existing diversity in the shadows, it is important that we bring historically marginalized communities into the spotlight, who are key contributors to the B Corp Movement. I believe one of the best ways to show our commitment to this is through highlighting efforts and opportunities at events and in learning environments. I'm very interested in environmental sustainability. Our national recycling issue is concerning and I'd like to bring more awareness and local solutions. Creating an inclusive culture is very powerful and we should have a strong focus on this in the B economy. I'm excited and ready to find out what the PDX community wants learn about over the next year. Knowing what those values are will be key to planning learning events and programs. Please join us in welcoming Rose and Kelsey and in thanking them for their service to our B Corp community.